I had been harassing him for an interview ever since the first day of the Triton Poker Series in Montenegro. But last night was a good night. 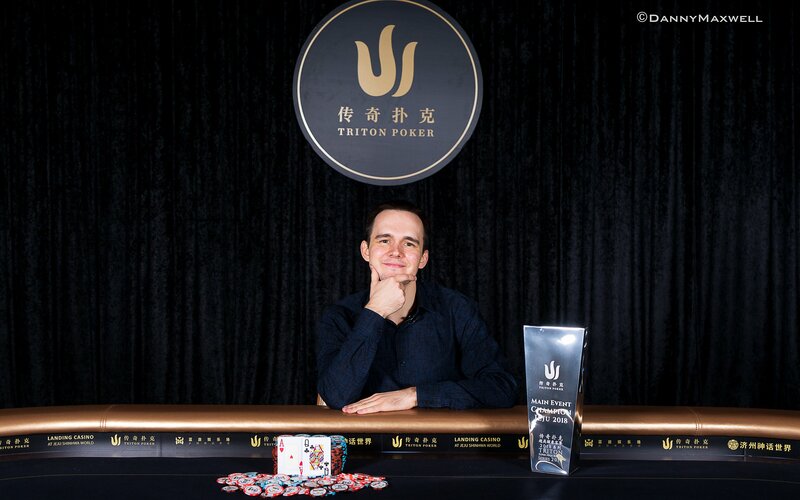 Badziakouski ended Day 2 of the Triton Poker Series Main Event in Jeju with the chip lead and was on course to win back-to-back Triton Main Events after he had taken down the one on the Adriatic Coast to earn $2.5m. Five people stood in the way. And here he was, willing to do an interview. I asked him what he would be doing if it wasn’t for poker. He’s a thoughtful man, so he took his time. Sam Greenwood began the brightest, as you do when you pick up AK twice in succession, in position, facing a pre-flop raise. In the first situation, Greenwood collected chips from Mikita Badaziakouski’s KQ, and then he squared up against Sergio Aido. Aido opened with QJhh for 70,000 under the gun, Greenwood made it 220,000 in position, and the Spaniard made the call. Aido checked, Greenwood bet 100,000, and Aido called. Aido checked again. The Th gave Greenwood straight potential, and he bet 400,000; Aido called. Aido made top two pairs, but Greenwood was dancing on Broadway. It was the worst possible card for Aido. He checked, Greenwood bet 1,190,000 and Aido went deep into the tank. Four-time bank chips lost before Aido made an incredible laydown. Greenwood moved up to 2.7m, Aido fell to 2.3m. Sometime later, when Aido picked up pocket queens, and the chip leader Mikita Badziakouski picked up pocket kings, you saw the Spaniard climbing into a coffin. He opened to 90,000 from under the gun, and then called a 370,000 three-bet from the chip leader. And then, an angel fell on the flop for Aido. The presence of the ace slowed everything down to a Neo dodging bullets style pace. Badziakouski bet 200,000, and Aido called. That ended the action as the Jc and 4s arrived on fourth and fifth street, and the pot went to Badziakouski. “You beat him by one,” Koon said to Badziakouski, correctly predicting that Aido held pocket queens. By the time Level 17 arrived, Badziakouski was the table captain. Chan Wai Leong picked up pocket tens, Badziakouski looked down at pocket aces, and they got it in. Chan was on the verge of elimination when a ten on the flop saved his tournament life, and he doubled through the chip leader. Richard Yong opened to 110,000 holding KdQd, Badziakouski called with AdQh, Aido did likewise with AJhh, and the action stopped at the hands of the short-stacked Chan who was holding pocket kings. Chan raised to 450,000, and only Badziakouski called. Chan bet 475,000; Badziakouski called. Badziakouski picked up a flush draw. Chan moved all-in for 1,205,000, and Badziakouski went into the tank before emerging with the call. The river bricked for Badziakouski, and the pair exchanged spots with Chan moving into the chip lead with 4,580,000, and Badziakouski falling to into the basement with 1,100,000. And then we lost Sergio Aido. The Spaniard had played well all day, despite having a terrible run of luck, and it continued until Jason Koon put him into the ground. Aido limped with AQo in the cutoff, Greenwood called in the small blind, Koon squeezed to 300,000 holding AKo, Aido moved all-in for 1,375,000, Greenwood stepped aside, and Koon called. A king on the flop left Aido drawing slim, and he was dead after the 3s turned up at the turn. Aido collected HKD 6,490,000 (USD 826,858) for his efforts. Greenwood raised to 125,000, Koon three-bet to 385,000 in the cutoff, and Badziakouski four-bet to 645,000; only Koon called. So we went to a flop with Badziakouski only having 100,000 behind. The dealer put AsKhJd on the flop, and all the money went in. Koon had flopped two pairs with AJo, but Badziakouski had flopped a set of kings and doubled up two community cards later. Then we had the most exciting hand of the final table. Badziakouski limped with AQhh in the small blind, and Chan checked his option with Q7o. The flop rained down As8s2c to strengthen Badziakouski’s hand, and he bet 60,000, and Chan surprisingly called. The turn was the 4d, and Badziakouski bet 175,000. Chan decided it was time to turn his hand into a bluff, and check-raised to 525,000. Badziakouski made the call. The river card was the 8d, confirming Badziakouski’s lock on the hand, and he bet 200,000, but Chan put him all-in. Badziakouski looked like a team of ants were eating him alive from the ankles up. He burned time bank chip after time bank chip, the incessant beep of the action clock likely burning a hole in his eardrum. Then with literally 1-2 seconds left, and no time banks to save him, Badziakouski made the call and just like that, retook the chip lead. “Anyone selling time bank cards?” Joked Badziakouski. Badziakouski opened to 120,000 from under the gun with A7cc, Koon three-bet to 410,000 from the small blind holding A6dd, and Badziakouski called. The flop gave both players a reason to play. Koon led for 230,000, Badziakouski moved all-in and had Koon covered, and he made a pretty quick call. The Qd and 5h changed nothing, and it took a while for Koon to register defeat. I think it was more frustration than thinking the board read differently but you could feel his heartache through the computer screen. Koon earned HKD 8,470,000 (USD 1,080,000) for his fifth place finish. Badziakouski moved up to 6.4m. And then the lead grew even more substantial. Greenwood opened to 150,000 on the button with AQo, and Badziakouski called in the big blind with pocket fives. A set for Badziakouski, and the top pair for Greenwood, but both players checked. A terrible card for Greenwood, as he turned two pairs. Badziakouski overbet the pot for 50,000, and Greenwood called. Badziakouski bet the size of the pot, and Greenwood called. The hand-propelled Badziakouski to 8.4m and Greenwood slid to the bottom of the counts holding only 870,000. “It’s a really good fifteen minutes,” said Badziakouski. Badziakouski opened with A8o from under the gun and then called a 525,000 shove from Greenwood who was holding K9o. The American had two live cards, but none of them hit the flop, turn or river, and the ace-high played. Greenwood was out in fourth place for HKD 11,550,000 (USD 1,471,528), his third seven-figure score of 2018. Then we lost Richard Yong. The Triton Poker Series founder opened to 165,000 in the small blind, Badziakouski three-bet to 500,000, Yong moved all-in for 1,945,000, and Badziakouski called. The dominating hand won, and Badziakouski took an imperious lead into heads-up against Chan Wai Leong. It ended with a cooler. Badziakouski opened to 175,000, Chan moved all-in with pocket sixes, and Badziakouski made the call. Only two cards in the deck could help Chan. He took off his scarf, the only show of emotion, although I am sure, a jellyfish was tickling his ribs. He thanked Chan and waited for the Tournament Director to butcher his name during the winner announcements. Yes, Justin Bonomo is a man on a mission. With the first prize of HKD 41,250,000 (USD 5,255,456) in the bank, he has now won more than USD 10,500,000 in 2018 alone, and only Bonomo can match that haul.